Future news – almost like Science Fiction. 2019 January: Speaking at the Kerala Literature Festival (Kozhikode). 2019 February: Speaking at the Hindu Huddle (Bengaluru). 2019 June: Third edition of the Bangalore's World-Famous Semi-Deluxe Writing Program. Time to sign up! More information here! Past news – A Historical Gazetteer... of sorts. 2018 December: Release of my fourth book in a year, The Mystery of the Cyber Friend is a cyber thriller for kids. It will be translated into hindi, marathi, tamil and kannada first. Download it for free HERE!!! /---/ Published a travel story from Casablanca in the Indian Express, a food story from Stockholm in BusinessLine, and a listicle about some of my favourite noir books from around the world in The Telegraph. /---/ Interestingly, my ancient novel Tandooriälgen (published in English as "Once Upon a Time in Scandinavistan") was discovered by Norwegian Radio and hailed as the must-read of the week! 2018 September: Launch of my new superhit novel "Den tropiske detektiven" in Stockholm, Sweden, followed by book signings at the Gothenburg Book Fair - here. Read the big FiB/Folket i Bild interview here! It of course received rave reviews in all the newspapers that matter! /---/ Also, reviewed an interesting new book about temple art theft, which incidentally is the theme of "Tropical Detective"! /---/ As usual, there was some travel: an interesting discovery in Gwalior of the world's oldest zero published in Mint Lounge, some great food and sightseeing in Kolkata, and a list of India's best but less visited heritage monuments! 2018 August: Travelled and ate as usual, this month it was time for gourmet fusion in Pondicherry. Sadly, VS Naipaul passed away, I wrote an obituary in National Geographic Traveller. 2018 July: Reviewed Bill Clinton's thriller about missing presidents in The Hindu, had a great lunch in Kannur in Kerala on behalf of BusinessLine, and had some adventures in Majestic, Bengaluru, in Indian Express. 2019 June: Went to Kerala to hunt for the best toddy bar with greatest seafood, and found it! Exclusive report for BuseinessLine's BLink. This month's story for National Geographic Traveller was on some of the more esoteric, and least known, but very fascinating, temples of Assam. /---/ And I was interviewed in the New Indian Express. 2019 May: On behalf of Conde Nast Traveller I went on a hunt for the perfect masala dosa in Mysore - and found it! - while also finding time to participate in a German radio documentary, hunt for Roman ruins in Tamil Nadu for Mint newspaper's Lounge weekend supplement, and enjoy the vegetarian pleasures (and some non-veg) in Ahmedabad, and also contribute to this big story on India's finest hill stations. 2018 April: This month in National Geographic Traveller, I go in search for and discover the glories of India's ancient capital city Kosambi - now a largely forgotten but still evocative ruin - and contribute an essay to The Indian Quarterly, and reviewed Ankush Saikia's new masterful thriller for The Hindu, a story about my own Majestic trilogy for Citizen Matters magazine, and eat out in style in Allahabad in BusinessLine! 2018 March: Stories published this month include a survey of debut detective novels by Indian authors in Open Magazine, a tribal food adventure in Assam in BusinessLine, as well as an analysis of... well... humour. If that matter can ever be analyzed in a way that makes sense. 2018 February: The second edition of Bangalore’s World-Famous Semi-Deluxe Writing Programme started at Shoonya and ran successfully up to April! /---/ Frontline Magazine did a great story on the Majestic trilogy! /---/ Published stories includes this cover story in The Hindu Literary Review about the Indian detective novel, the second part of my Athenian food adventure in BusinessLine (continued from the previous month) and a Delhi streetfood guide! 2018 January: "Tropical Detective" book tour to the Jaipur Literature Festival (Rajasthan) Bengaluru Literature Festival and Brahmaputra Literature Festival (Guwahati, Assam). Read interview here! /---/ Release of newest travelogue, "A Walk Through Barygaza"! /---/ Stories published this month include luxury life in Rajasthan in National Geographic Traveller and eating classic food in Greece in BusinessLine. 2017 November: Speaking tour that took me to Kolkoto, Allahabad and Gwalior - where we bumped into our author friend and historian Prof. Ramachandra Guha, who was exploring the same ruins that we did! Also, in Outlook Traveller this month, I wrote about a fantastic new hotel in Sindhudurg while in BLink I reported from my holiday in Sri Lanka! Last but not least, I published a funny little article in The Hindu about junk-food in the fiction of RK Narayan. 2017 October: Mostly busy doing final edits on a couple of books - three in fact - that will see the light soon. Also went trekking on behalf of National Geographic Traveller, reviewed a new Indian thriller for The Hindu, and a Swedish thriller got its due in India Today, but I also found time to go to Shillong and do some serious tribal eating as well as an eating holiday in Goa! 2017 September: In the BusinessLine this month, I had tandoori chicken in Chandigarh and I was also exhibited as an artwork in a gallery in Mumbai. 2017 August: Reviewed an odd crime novel set in Pakistan for the New Indian Express, a brilliant Japanese crime thriller for India Today, the BusinessLine Tummy Travels column for the month took us to Sri Lanka, and also managed to find time to do a fun talkshow with Vivek Shanbhag. 2017 July: Inaugurated the new and very popular creative writing course - Bangalore's World-Famous Semi-Deluxe Writing Program - with both fiction and non-fiction classes designed by myself, novelists Anjum Hasan and Eshwar Sundaresan, and Shoonya Centre for Art in Bengaluru. Here's a brief description of the course: "Designed with a lot of care, thought, research and experience, Bangalore’s World-Famous Semi-Deluxe Writing Program will make you an aware and innovative writer in either fiction or nonfiction. Or both! Over 3 months, you will spend your weekend mornings in a classroom learning skills, understanding craft, and trying your hand at a range of genres, while using your spare time to complete assignments that will be reviewed by the faculty on an individual basis. This hands-on and interactive experience promises to be an engaging way to challenge yourself to do something new. By the end of the workshop you will be writing courageously and skilfully." /---/ Wrote about the art of travel and travel writing in Nat Geo's anniversary issue and in a slightly related piece wrote on Delhi belly in BusinessLine, and the same article was picked up by a French newspaper. /---/ Here's an interesting piece on Malgudi which refers to a story I had published years ago in Nat Geo Traveller. /---/ The month also saw the launch of the Bangalore Graphic Novel at Goobe's Book Republic, but you can also buy it online if you missed the launch! 2017 June: Spoke at the first ever Mysuru Literature Festival on June 4th. Lovely event, great fun! /---/ Wrote on Buddhist food in Bylakuppe for Nat Geo, Viking grub in Scandinavia in the BusinessLine, interviewed Arundhati Roy for the Hindu, got myself interviewed in the Times of India, and also explored the world of children's literature - and the same article got picked up by a Swedish newspaper. 2017 May - Mostly in the world of Books: Reviewed Anees Salim's much awaited new novel for The Hindu Literary Review, published a long essay on the growing phenomenon of true crime writing in Open Magazine, went on an adventurous journey in rural Gujarat in Mint Lounge and finally this month's BLink column is fully non-veg! 2017 April - Eating and Feasting month: This month's articles include one on the amazing Dasara celebrations in Coorg in National Geographic Traveller, accompanied by this story on eating pork in Coorg in Outlook Traveller, the extravagantly exotic fusion street food one nowadays finds on any street corner in Bengaluru in BLink, and drinking tea in Sri Lanka for the Teabox blog, and as usual did my monthly chat with Swedish Radio channel P4. Besides there was an interesting article on Indian noir fiction in Navhind Times mentioning yours truly, and another on the same subject in Firstpost! Something is clearly going on! 2017 March - The harder one works the more one writes: Recent articles published include big review of new South Asian crime fiction in Open Magazine, a column on writing more thrilling thrillers in New Indian Express, cover story on ancient India's great Greek port city Barygaza (present-day Bharuch) in The Hindu and a companion story also on being a tourist in ancient Barygaza in National Geographic Traveller, eating nicely in Singapore and Hong Kong in BLink, having the best cup of tea in Beijing for the Teabox blog, a column on Bengaluru's perhaps most important street from a writers point of view in Metroplus and the most important street from the point of view of a reader in BusinessLine, and then of course the Bengaluru Graphic Novel is making waves - as it should. 2017 February: Jobbing and slogging away all month, but published a few pieces like this one on my favourite food, the ancient and wholesome ragi mudde, and also reviewed a new crime novel set in the colonial world, a mountaineering thriller about Mount Everest, published an interview with pioneering Bhutanese novelist Kunzang Choden, and chatted in Swedish Radio channel SR-P4. The much awaited Graphic Novel is finally out and starring is of course the local hero Hari Majestic in a new, crazy case! In full colour! And with art by the eminent graphic novelist Harsho Mohan Chattoraj. Sample the artwork underneath as featured in "Bangalore, A Graphic Novel" edited by Jaideep Undurti! /---/ Speaking of Mr. Majestic, he was also mentioned in this recent article about the Indian detective fiction scene. 2016 December: Spoke at the Gujarat Literature Festival on Dec 18 Sunday (Kanoria Centre for Arts, Ahmedabad), which became a fun-filled session and I was happy to see all of you there! And I was also happy to see my own mugshot on posters (see below) in so many bus stops of the town. /---/ Otherwise a rather productive month, working on stuff for both National Geographic and Outlook Traveller magazines, and with plenty of stories in print, too: travelogue from Bylakuppe in The Hindu, a review of a new meta-detective novel in the same newspaper, a guide to Bengaluru's oldest shady bars in BusinessLine, a National Geographic Traveller book-love guide, and a guide to the end of the world published in Indian Express on the new year's weekend. /---/ Thriller writer Mukul Deva, by the way, listed "Hari, a Hero for Hire" as one of the best reads of 2016! 2016 November: Busy working - but managed to put out a couple of stories, on the spectacular growth of literature festivals in India and also a review of Ambai's new detective novel in English translation, and finally in case you go to Bhutan here is what to sip in the seedy bars. 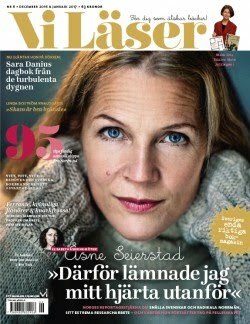 In Swedish, I published a travel & literature photo essay in popular book magazine Vi Läser, unfortunately the story is not available online, but you can see the magazine cover underneath... or why not just go to the nearest news stall and pick up a copy? /---/ Also, Mr. Hari Majestic, the famous detective, was written about in the Mirror! 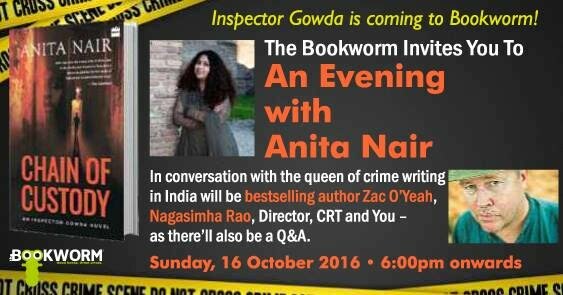 2016 October: There was a fun book talk with Anita Nair at Bookworm in Church Street (Bengaluru) on Sunday 16th October at 6.30pm! And this was my last public appearance in Bengaluru for the time being, until my own next book is out... So goodbye until Hari Majestic is out on the streets again! 2016 September - released lots of new stuff: The Swedish anthology "Finnjävlar" (Publisher: Verbal Förlag) edited by Kristian Borg - is a one of its kind book about the Finnish minority population of Sweden and features contributions by all the prominent Swedish/Finnish authors like Susanna Alakoski, Mats Kolmisoppi, and my own autobiography which is still a bit of a work-in-progress - but the book is getting good reviews as an important addition to migrant literature. See the iconic cover underneath... /---/ Also, the release of the new Un Rodo Cora album "Love Thy Neighbor" happened and I am of course appearing on the album in some vaguely spiritual form - at the former Pet Sounds bar in Stockholm on September 20th. The band performed the entire album (listen to the album on Spotify) but I had to celebrate by proxy with a lunch at Folksy Food in Madikeri - perhaps the best restaurant in all of India. /---/ This month's best reads include - according to myself - this piece I wrote on a Scandinavian church built to worship fish, a Nat Geo piece about hogging offal in Shivajinagar's meaty district, a story on legendary pop manager Simon Napier-Bell who recently did a speaking tour in India, and my account of a long-awaited visit to Bhutan and about the butter tea that I drank there. 2016 August - Busy month: Did a really funny booktalk on August 9, a Tuesday at 6.30pm at the British Council Library in Bengaluru - I was interviewing author and film producer Simon Napier-Bell, former manager of The Yardbirds, T Rex, Ultravox, Wham! etc about his hilarious books on pop music history! It was a packed house with standing room only... Hear an audio interview I did with Sir Simon here! /---/ On Tuesday 23rd August at 6pm at the Press Club in Cubbon Park, I launched thriller author Shashi Warrier's new bestseller, "The Man Who Wouldn't Be God" - people in the audience said it was the funniest book launch they'd ever been to! /---/ Towards the end of the month I spoke at the Mountain Echoes literature festival in Bhutan - among other things I did (if we forget about my karaoke show at Mojo Park nightclub) talkshows with Anish Sarkar, Venita Coelho and Turkish writer Çiler Ilhan - and it was a lot of fun. Her Majesty Ashi Dorji Wangmo Wangchuk, the Royal Queen Mother of Bhutan who is also a fellow author, came for one of the shows and afterwards stepped up to give me a pat on the back to tell me I'd done a good job (see snap underneath). She is very kind. Incidentally, I just reviewed Anish Sarkar's new thriller for the New Indian Express; click to read! /---/ And finally, this month's column is set in Kerala, exploring Thalassery's little known links with the birth of heavy metal music and I also reviewed this fascinating book on Sri Lanka! 2016 July - Quiet month: Busy editing my own next novel but managed to do a bunch of book reviews somehow and also this interview with Bengaluru's most bestselling author Anita Nair who launched her latest detective novel this month. I also walked around in the Majestic area which turned into this story. 2016 June - Fun time: A very delightful book talk was held at the Taj Bengal in Kolkata - thanks to all of you who attended and picked up signed copies. Signed by hand. It took a lot of time. But it was worth it. 2016 May - Sad month: Spoke at a memorial event held at the Swedish Writers' Union in Stockholm about my dear friend, the travel writer and literary critic Tomas Löfström who died of cancer earlier this year. It was good to meet and chat with all the old friends of Tomas. /---/ While in Sweden, the national broadcasting corporation Sveriges Radio did a radio documentary about my life. Online you find the extended 88-minute version. /---/ This month's food and travel column was an exploration of Chinese food in Kolkata and its history. The story was also published in Swedish here. /---/ Release of "House Spirit: Drinking in India" (Publisher: Speaking Tiger) edited by Palash Krishna Mehrotra and in which... well, you probably guessed it: Mr. Majestic makes a guest appearance. Something to read while you pour yourself that evening peg. See cover underneath! 2016 April - Rough month: Spent most of the month editing the next novel which is to be released in 2017. /---/ I was also interviewed in this Singapore based magazine called Kitaab and Swedish newspaper Dala-Demokraten. My Bengaluru sandwich story got some interesting responses and might lead to subtle improvements in the city's sandwich culture. 2016 March - Horror month: Hectic writing period: while working towards finishing the next Mr. Majestic book, I also had time to do this horror cinema cover story for BusinessLine and drank lots of cold drinks for BLink, and I also visited the centre of the earth on behalf of National Geographic Traveller and finally I also did this interview with American crime novelist Laura Childs who writes tea mysteries. 2016 February - Faffing month: Hectic speaking and touring continued from January – including dates at Kolkata Book Fair (February 6th: "Writing the City"), Jaipur (February 11th), MAD Salon (February 13th), Sahakarnagar (February 17th), Urban Writing Festival (February 19th-20th), and finally... what was to be the last talk this season, at Times of India Bangalore Literature Festival in Jayamahal Palace Grounds (February 21st), was cancelled due to the festival getting cancelled! Phew! Anyway, here's my litfest memoir! /---/ This month's best stories included a modern Viking trip in the Baltic Sea and the best seafood meal I had in a long time - and in Goa, of course! 2016 January - Yapping month: Hectic speaking and touring as usual, this time of year – Lekhana Literature Festival (January 10th), iBrowse Book Club (January 14th), Delhi Book Fair (January 16th), Delhi Crime Writers’ Festival (January 17th). I did also end up at Jaipur Literature Festival and spent many pleasant days in the authors' lounge. Finally I did a suspense fiction workshop in Indiranagar on January 30th hosted by YourStory.com. /---/ Stories published this month included a trip to the Bhimbetaka caves with stone age paintings and some of the choicest junkfood you may get in China! 2015 December: Festival appearances at the Bengaluru Literature Festival where I did a fun talkshow with one of my favourite novelists, Upamanyu Chatterjee, and then there was a workshop on how to write suspense fiction - always lots of fun - and a panel session on detective fiction. This was followed by the Goa Arts and Literature Festival in Dona Paula, near Panjim city, where I was on (as usual) a panel on detective novels and also a fun travel writing panel with author Janhavi Acharekar. /---/ I also interviewed Amitav Ghosh for the Hindu newspaper, had some coffee in Somwarpet and walked around Bengaluru town. /---/ Reviews started coming in for the new novel, "Hari, a Hero for Hire", and so far so good, one might say: "Detective fiction unlike any kind of detective fiction ever written before" (The Hindu), "More than once, the plot will remind one of South Indian as well as Bollywood films" (The Pioneer), "The larger-than-life pep and total unbelievability of a desi crime thriller" (The Sunday Standard), "It’s snazzy, jazzy, pizzazzy, all things irreverent" (New Indian Express), and "A brilliant comedy of manners... the book is a joy to read, because of O’Yeah’s sparkling prose peppered with wit and dollops of observational humour" (Sakaal Times). /---/ Received author copies of an anthology of writings by Mahatma Gandhi on the subject of non-violence, for which I had provided the preface; kindly see picture underneath. 2015 November: Bengaluru launch for "Hari, a Hero for Hire" was hosted at Atta Galatta bookshop on November 7th at 6pm. You all came! So nice! And I was in conversation with Sudarshan Purohit, the great translator of Hindi pulp thrillers. /---/ Due to popular demand a second Bengaluru launch was added in the Cantonment area for the convenience of those who were reluctant to stray too far away from MG Road: Friday the 13th of November at 7pm it was held at Goobes Book Republic in Church Street! You all came again and listened to me and The Majestics blues band. /---/ By some mysterious lucky chance both "Hari, a Hero for Hire" and the rereleased "Mr. Majestic!" found themselves on the top 15 bestseller list at Sapna Bookstores - Hari clocking in at 5th position and Mr. Majestic at number 3! Similar phenomena was reported from most New Delhi bookshops. 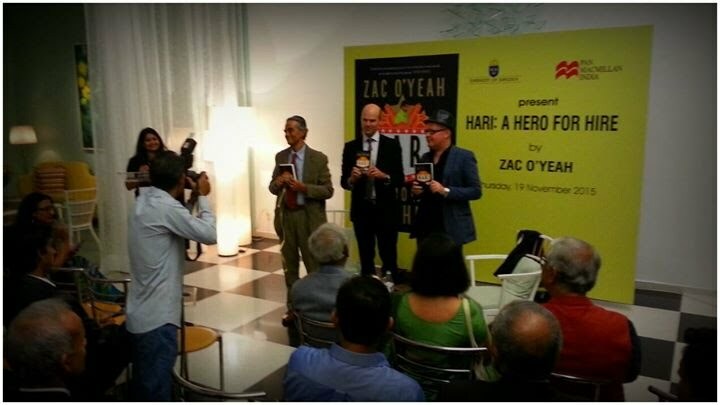 /---/ New Delhi launch for "Hari, a Hero for Hire" took place on 20th November, at Oxford Bookshop in Connaught Place, where I was in conversation with the inimitable Jai Arjun Singh. The night before the bookshop launch there was a launch party at the Swedish embassy, at which the great novelist Upamanyu Chatterjee was the chief guest of honour. 2015 October: New thriller out in English, titled "Hari, A Hero For Hire" (Pan Macmillan); read an excerpt here and the manifesto is in Times of India, as usual. However, if by some unlucky bizarre mishap the novel is not available in your nextdoor bookshop click this link to have it delivered anywhere in the world and almost for free. If you don't want to read the whole book, just read what Ashok Banker, the pioneer of Indian detective fiction, wrote on the front cover. And tell your friends. People already tweet about it like maniacs. /---/ This month's issue of National Geographic Traveller takes me to Ujjain, among other places, to study astronomy! And in BusinessLine weekend supplement BLink I study creative writing! /---/ Also, an old acquaintance passed away, writer Henning Mankell, and I was asked to write an obituary for The Wire. Very sad. /---/ Later in the month, watch out for the anthology "Drinkers Tales from Here and There" edited by the great Palash Krishna Mehrotra in which you can expect to find some juicy fiction (including some of mine). 2015 September: Appeared at a students' litfest at Mallya Aditi International School on Sept 4th and spoke on the importance of local detective novels. Spoke at Anita Nair's creative writing course later in the month. Wrote a piece on Agatha Christie for Times of India, reviewed Stephen King's latest in New Indian Express, published a fun column in BusinessLine, and had tea in Taiwan. 2015 August: Finished a complete draft of the novel that will be out in 2017. Much work and editing remains to be done, but it looks like the adventures of Hari Majestic are set to continue... /---/ Also wrote this story on Beatles-tourism in Liverpool. 2015 July - Jobbing: Tour of Madhya Pradesh which will result in a fresh set of stories for National Geographic Traveller (if you didn't pick up the July copy already it carried my recent food adventure in Thalassery in Kerala which resulted in a lot of excited feedback from foodies and Thalasserians) and I also had a nice food adventure in Bhopal which was featured in BLink. In the same magazine, an Icelandic memoir of mine also was printed. This month also saw my farewell column in Mint Lounge. All good things must come to an end, as the column also, perhaps, suggests. Book reviews published included this one in Indian Express. 2015 May - Another superhit month: The cover story in newspaper BusinessLine's weekend supplement BLink was on my quest to find the fictional city of Malgudi, my Taiwan story was on the cover of National Geographic Traveller (India), and a new hit track was released by Swedish pop group Un Rodo Cora with me, again, on backing vocals: The Crawler. The detective hero "Mr. Majestic!" was ranked in the UK newspaper Daily Mail among the best Indian fictional detectives, and described as "delightful". Last but not least, one of my older novels ("Tandooriälgen" which has also been published as "Once Upon a Time in Scandinavistan") featured as number 2 in this top ten list of literary must-reads; considering that "A Clockwork Orange" is number 1, I'm not too unhappy about the second place ranking. My last crime fiction round-up also appeared in newspaper supplement Mint Lounge, putting an end to six and a half years of reviewing the best and worst of thrillers. 2015 April 1 - The Funniest Day of the Year: A new Mr. Majestic thriller came out in Swedish, this time titled "Operation: Operation", and already hailed by leading Swedish national daily newspaper DAGENS NYHETER as a “classic”, and other newspapers seem to agree: “O’Yeah is, as usual, an entertaining guide who moves around with familiarity in Bangalore’s back alleys as well as in the daily lives of his fictional characters” wrote UPPSALA NYA TIDNING; “Screamingly funny and familiar fervour” wrote GÖTEBORGS-POSTEN and “Funny? More than so: Fully crazy!” wrote YSTADS ALLEHANDA. The same book will be out in English later this year - but with a different title - with a possible launch date in October. I had quite a lot of fun signing the over hundred pages long publishing contract. The Swedish cover - ain't it a beauty? - is pasted above. /---/ My own review of Stephen King's perhaps best novel so far was published in New Indian Express: Revival. /---/ Also did a much appreciated talk at the MS Ramaiah Institute of Technology, addressing the student members of the Readers' Society in a hysterically funny conversation moderated by Miss Sonali Bhatia (here in the photo underneath we are in the presence of Shri S.M.Acharya who is making the closing remarks). 2015 March - Back to writing: Contributed a special piece for the anniversary issue of a magazine called Harper's Bazaar that had rounded up a bunch of bestselling celebrity writers for the event. Story on eating junkfood in Taiwan - a subject close to my heart - was published in National Geographic Traveller (or was it in the Feb issue?). Also was just commissioned to write a long piece for India Quarterly's next issue and which is sure to be fun, while two excerpts of earlier writings were selected for anthologies to come during the next year. And on the whole the work on my next to next novel proceeds well. All's well that ends well. 2015 January - Thriller time: Appeared in two talkshows - onstage with great writers like Mukul Deva, Aroon Raman, Tarquin Hall, Patrick Bryson and Jane de Suza (see photo underneath by thriller writer Salil Desai of me saying something profound while the other three celebrated writers on stage are freezing their heads off while I pompously pronounce something or the other) - at the first ever International Detective Fiction Festival in New Delhi hosted at the Habitat Centre on Jan 17-18. Prior to that in Kolkata, I did a session at the Apeejay Kolkata Literature Festival on Jan 16 together with the Swedish master crime writer Håkan Nesser, the amazingly French thriller writer Caryl Férey, and Lady Kishwar Desai. Here's what I thought on the festival experience (in my column in Mint Lounge) /---/ The Times of India Literary Carnival was back at Jayamahal Palace grounds in Bengaluru on the last weekend of January where I was in conversation with the wonderfully witty fantasy novelist Samit Basu on Jan 31 and Feb 1, and other writers. 2014 November - New art project: My hardboiled real-life story accompanied by Clare Arni's stunning photographs from "The Notorious Rowdies" art project was published in GQ Magazine in India. The eminent literary critic and genius editor Jai Arjun Singh later sent me a note regarding this selfsame issue, "just read your rowdy piece in GQ. Magnificient. You are the Rajnikanth of the literary universe." Kindly study a rowdy picture underneath. /---/ The paperback edition of my popular detective novel "Operation Sandalwood" was seen in shop windows all over Sweden, a real must-own. 2014 October - Festival season continued: So there I was at the delightful Chandigarh Literature Festival in a fascinating conversation with literary critic Vijay Nambisan about my bestselling thriller "Once Upon a Time in Scandinavistan" (31 October-2 November). 2014 September - Festival season: Thanks to all of you who came and heard me at the Pune International Literature Festival (18-20 September) and also to those who came to the Bengaluru Literature Festival (26-28 September). What a blast it was. Underneath a photo of my good self in conversation in Pune with the amazingly bestselling and amazingly amazing Ashok Banker. /---/ I was also interviewed in Shanghai. 2014 August - Caught on camera: Did some modelling work for the famous photo artist Clare Arni, for her upcoming exhibition "Notorious Rowdies"; a sneak preview of which is going to be published in the November issue of GQ Magazine. 2014 July - Read all about it: In the Times of India, where else? 2014 May - Back on the road: Tour of Taiwan - and you'll read all about it in a forthcoming issue of National Geographic Traveller. /---/ The paperback edition of 'Operation Sandalwood' hit the book market (see paperback cover underneath). 2014 April - Editorial work: Think I just finished writing and editing my next novel and it looks good. Did I hear you say: When is it out? Perhaps next year... yes of course, see you at the launch. 2014 March - Back in China: Next world tour began! The literary tour of China was a handy and compact trip involving onstage meetings with many eminent writers in Chengdu on March 10 (see picture underneath) and during the week that followed there were several talkshows in Beijing on March 11, 12 and 14. Although there are one billion people in China there was no stampede. /---/ New exciting developments on the writing front means that I will be working with the excellent literary agent Shruti Debi of Aitken Alexander Associates on my next one... or five books, or so. 2014 February - Back in Bombay: Final leg of the world tour consisted of two appearances at the wonderful and whimsical Kala Ghoda Festival for Arts and Literature, downtown Mumbai; yours truly was speaking on Feb 5 and Feb 6. The Mystery Writing Workshop was again packed and fun-filled, but of course it had been listed as "not to be missed" in several newspapers and on websites such as this one here. /---/ Also yours truly did a panel discussion with authors Anita Nair, Sharath Komarraju, Jane De Suza, Eshwar Sundaresan and C.K. Meena on "The Imagined City in Crime Fiction" on Feb 9 (Sunday) at the St Joseph's College annual cultural festival in Bengaluru - it was an animated session which was hard to wrap up because there was so much to say on the subject. /---/ The Mr. Majestic novel was launched in Germany where it seems to pretty immediately have got extremely good reviews in Die Welt and other papers. 2014 January - Bengaluru Bash: The big thing this month was the inaugural edition of The Times of India Literary Carnival held on January 24 to 26 at the venerable Jayamahal Palace, an old favourite haunt. The grub was excellent, possibly the best available on the festival circuit. There was an exciting panel of detective fiction - under the theme "Does Crime Pay" - with yours truly and a host of other luminaries of the thriller galaxy including the eminent moderator Vasudev Murthy (author of "Sherlock Holmes in Japan"), Manjiri Prabhu, Barun Chandra and Manreet Sodhi Someshwar (author of "The Hunt for Kohinoor"). /---/ Also yours truly appeared as chief guest and interlocutor at the packed TFA launch of Srinath Perur's excellent travelogue "If it's Monday it must be Madurai" (Penguin India) at Sapna Bookstore, Bengaluru, on Jan 31. 2013 December - Another kind of Homecoming: The movie rights for "Mr Majestic!" were sold and the film will be made during 2014. /---/ The almost last leg of the world tour included a talkshow at Urban Solace Cafe for the Soul (Bengaluru) where I was in conversation with author Christina Daniels. See poster underneath. 2013 November: Wrapping up work on next novel draft, slowly-slowly. Film offer to do "Mr Majestic" on the big screen; more on this later and keep your eyes glued to this space. 2013 October - World Tour Goes On: After a visit to Finland, the European leg of the world tour ended with a well-attended talkshow at Skärholmen (Sweden). The Scandinavistan adventure will result in stories for National Geographic Traveller, Outlook Traveller, ELLE, and other magazines. 2013 September - A kind of Homecoming: European leg of the world tour touched Stockholm where there was a performance night and book release party at a bookshop together with folkrocker Stellan Wahlstrom (Sept 19; Rönnells) followed by an Indian themed talk for the Swedish Society of Detective Fiction Aficionados (Sällskapet Deckarvännerna; members only), and these were in turn followed by half a dozen gigs in Gothenburg at the Swedish Bookfair - myself in conversation with Håkan Nesser and Kjell Eriksson, and a big seminar on the trend of Swedish detective novels set in foreign countries, featuring myself again in conversation with the amazing Kjell Eriksson and the show was anchored by Maria Neij. /- - -/ Also, Finnish TV channel YLE shot a documentary about myself. 2013 August - Gallivanting: Took time off from writing my next novel, and wrote a piece on my favourite bazaar, the great computer bazaar of Bengaluru's old town in a special issue of TimeOut Magazine - see cover art underneath. 2013 July - Hogging: Took time off from writing my next novel, and published feature on Chinese traditional fusion food in Forbes Magazine (India) - issue will remain on stands until August 9. 2013 June - Talking: Took time off from writing my next novel, and did a book talk at Easylib in Koramangala with the brilliant new writer Eshwar Sundaresan, author of "Behind the Silicon Mask", one of the best Indian thrillers of the year. 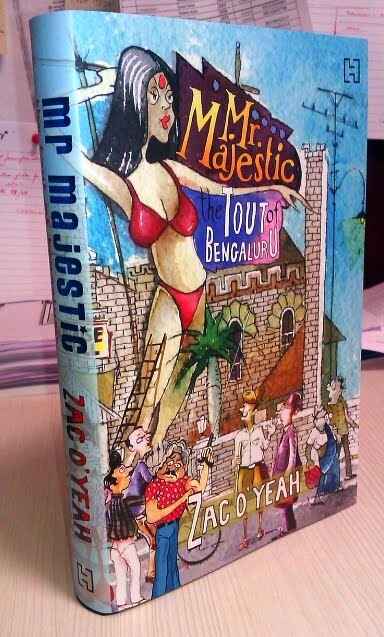 2013 May - Celebrating: The release of ‘Mr Majestic!’ at Oxford Bookshop in Indiranagar ... Lo and behold, book-lovers came despite the monsoon storm. 2013 April - Bibliophiling: The release of bibliophile gem ‘The Best of Indian Fiction: 50 Writers, 50 Books.’ An anthology edited by Pradeep Sebastian & Chandra Siddan, published by HarperCollins. Check me out page 290. And do read all the other pages too. 2013 March - Launching: The Goa launch of "Mr. Majestic" happened at International Centre, Dona Paula - a playful discussion together with eminent Goan writer Jose Lourenco on March 23 - and the event was followed a day later by a well-attended workshop in how to write suspenseful fiction and detective stories on March 24. On March 30, finally, was the Bengaluru launch of "Mr. Majestic", hosted by TFA at the British Council Library, packed hall and intense discussion with Sugata Srinivasaraju, editor of the Vijay Karnataka newspaper. /---/ The Swedish edition of the novel, "Operation Sandalwood! Ett dödligt uppdrag för Mr. Majestic", was released to practically unanimous critical acclaim (Aftonbladet: "a wonderful book"... Dala-Demokraten: "Perhaps Hari Majestic has an ancestor in Dashiell Hammett's 'Sam Spade' or maybe he is a reincarnation of Raymond Chandler's hardboiled hero 'Philip Marlowe'?" ... Corren: "a fresh wind is blowing over the Swedish detective fiction scene") and the novel became an instant bestseller, and Swedish national television broadcast a short documentary about me as a part of its Babel literary show. 2013 February - Showtime: Talked a lot at Kala Ghoda Festival (Mumbai), first as moderator in a discussion between writer-director Piyush Jha (author of "Mumbaistan") and Avan Jesia (author of "Tower") on writing about the city, in the David Sassoon Library Garden on 3rd evening, and then did my traditional workshop in Writing Suspenseful Detective Stories at the Kala Ghoda Association - the hall was packed - on February 6th. /---/ In addition, National Geographic Traveller carried a story on Shanghai. 2013 January - Faffing: The first reviews of “Mr. Majestic!” appeared. Timeout Magazine wrote “your brain will be sharpened, and your gut ought to enjoy the roller-coaster ride. O’Yeah holds the plot together; his writing completely in tune with Bengaluru's underbelly, it rings with the authentic creak of the cogs on which the city’s miscreants run its machinery. Reading Mr Majestic is the closest you might ever come to downing a quarter of Gagarin of Gokak Falls in the back room of a shady bar in Bengaluru. So do it.” The novel reportedly sells like hot cakes in certain bookstores. /---/ Swedish television show “Babel” visited to make a short documentary about me and the new book. /---/ Read the following long interview in DNA newspaper. /---/ To celebrate the launch of my twelfth book, commenced a tour of “Workshop in Writing Detective Fiction and Suspenseful Stories”. The inaugural workshop was held at JNU in New Delhi on January 21st, following which there were two more well-attended workshops during the Jaipur Literature Festival. The festival itself had two very enjoyable talk sessions, first on the author Ian Fleming and his fictional creation James Bond - a discussion involving my good self, Sebastian Faulks (author of "Devil May Care"), and Andrew Lycett (author of "Ian Fleming") - and the following day there was an even more interesting session on the craft of the spy thriller - a discussion with my good self (again, of course) and Joseph Kanon (author of "The Good German"), moderated by Andrew Lycett. 2012 December: New sensational detective novel arrived from the printing press, smelling of the freshest ink you ever got fresh with. "Mr. Majestic! The tout of Bengaluru" is the title to watch out for. Described by Tarquin Hall, author of the Vish Puri series as follows: "Zac O'Yeah's crime fiction is quirky, amusing and teeming with unforgettable characters. A deliciously waggish take on modern India with all its idiosyncrasies and complexities." – And by bibliophile Pradeep Sebastian (author of "The Groaning Shelf and Other Instances of Book Love") as follows: "Among the many genre pleasures of Mr Majestic: The Tout of Bengaluru is a redolently pulpy Indian thriller that doubles as authentic Bangalore noir. Zac O'Yeah and Hari Majestic - local firang pulpmeister and international local detective – arrive on the scene of the crime to give us an amusing, zippy, suspenseful mystery that will have you properly sandalwooded and Bangalored, Majestic style." /---/ The first person to read the book seems to have been the indefatigable literary ace Nr. 1 blogger Jai Arjun Singh. /---/ Chapters of “Mr. Majestic! The Tout of Bengaluru” appeared over two weekends in the popular newspaper Vijay Karnataka in translation into Kannada! Something which one is very proud of. 2012 October: Writer-in-Residence in Shanghai, China; public lecture in Shanghai. 2012 September: Writer-in-Residence in Shanghai, China; public talk in Hangzhou. 2012 August - Going East: Book promotion tour to the Beijing International Book Fair, China. Talkshows at the fair on August 29 and August 30 - among other things in conversation with author Petter Lidbeck (who writes phenomenal crime novels under the pen name Hans Koppel). /---/ Pick up a copy of Forbes (India) Magazine with a story on the Greek tragedy. 2012 July: Editing the novel that you will all love to read soon. /---/ The Indian edition of National Geographic was launched, a really wonderful travel magazine, and yours truly had a story on searching for Alexander the Great in Alexandria (Egypt) in it. It looks like I'll be in every other issue, already in the August issue there's a story on Coorg, and more travel plans are in the making. So follow my journeys in National Geographic magazine from now on. 2012 June: The longest book reading tour reached Koramangala. 2012 May: The novel "Tandooriälgen" (originally published in 2006, also available in English with the title "Once Upon a Time in Scandinavistan") made it to this honors list of the 200 must-read sci-fi novels. 2012 April: Work on "The Pollutant" graphic novel &c.
2012 March: Anjum's new work of fiction, "Difficult Pleasures" (Penguin), was launched at three different venues in New Delhi. 2012 February: Both Anjum and I uttered select words at the Lekhana Literary Weekend (10-12 Feb) held at the National Gallery of Modern Art, Bengaluru. /---/ A few days later, recorded some roaring backing vocals for a zombie metal track on a forthcoming album by "IA", the phenomenal frontman of Freak Kitchen, to be released later this year. /---/ Enough talking, time to do some writing. 2012 January: Work 24/7, no fun, was asked to write an obituary for one of my oldest friends, the stepfather of Indian rock, Amit Saigal who died in Goa. /---/ Forthcoming novel was listed as a title to look forward to in 2012 and also mentioned in this interesting article on the new wave of Indian detective fiction. /---/ Received author copies of an anthology called "Pilgrim’s India" (ed. Arundhathi Subramaniam; Penguin 2011, ISBN 9780143414148) with a nice old piece of mine, the essay "In the Buddha’s Shoes: A Search for Exact Spots and Complete Truths" - this wonderful anthology also has writings by Arun Kolatkar, AK Ramanujan, Mark Twain, Hsiuan Tsang, Paul Brunton, Andre Malraux, Allen Ginsberg, Deborah Baker, Suketu Mehta, Arthur Koestler, Kabir and others. 2011 December: Anjum and I were at the Goa Arts and Literary Festival (17-21 December) at International Centre, Panjim. Did an engaging if somewhat improvised talkshow on detective novels with the erudite book lover Jai Arjun Singh. 2011 November: Received first copies of the new Un Rodo Cora album "Beijing-Bangalore" (BELPID037) which must count as one of the finest pop albums since Beatles For Sale, and I am not saying this just because I "helped" out with the vocals... but the album has some seriously amazing songs. /---/ More good news: Arfi Lamba, who acted in the Oscar-winning movie "Slumdog Millionaire", will be starring in my vegetarian zombie movie "The Pollutant", according to the latest news from the Goa Film Bazaar. 2011 October: Performed at the Lit for Life Festival and did a fun session, The Tragedy Workshop: The Hardships of Writing, at which I discussed the nitty-gritty of writing and reading fiction, the whole event was organized by The Hindu newspaper in association with Siyahi, in Chennai on October 29. /---/ The Caravan magazine carried a graphically illustrated piece on the enduring popularity of Agatha Christie (it can also be read online but you'd miss the illustrations, so better get hold of the magazine), plus another somewhat related story in Tehelka. Also published my story on Turkey in Outlook Traveller (English version) and in RES (Swedish version). Plus all the usual work. 2011 September: Finished new novel, the first territorial right sales happened within two days of submitting the manuscript (I am starting to suspect that I am really fortunate to have a great literary agent interested in my work... Nat Sobel at Sobel Weber Associates, in case you wondered...). Meanwhile, work on zombie comedy film continues. 2011 August: Check out this six-page Egypt story in Forbes Magazine. 2011 July: One of those 24/7 months. 2011 June: Outlook Traveller Magazine's special ten year anniversary issue featuring a selection of the best travelogues of a decade put, very gracefully, both Anjum and me on their cover. Then "Once Upon a Time in Scandinavistan" was featured as Nr. 2 on the Fiction Bestseller list on Hachette's India website. And on June 20, I did a bookshop event for Timeout Magazine, a rather enjoyable discussion session with literary critic and translator Sudarshan Purohit on Stieg Larsson's Millennium trilogy, which Timeout has nominated as one of the best works of crime fiction of all time. To be on the safe side, I pointed out to the audience that I wasn't Stieg and that I wasn't dead either. Last but not least, traffic to this website (www.zacoyeah.com) has gone up by 97,9% during the year. Thank you all for dropping by! 2011 May: Tour of Egypt. 2011 April: Writer in residence in Athens working on a new sort of kind of travelogue project. End of month hiked across Turkey's many wonderful offbeat spots for RES Magazine. Met up with rock musician and buddy Stellan Wahlstrom and his drifting band in Istanbul and did a cultural exploration of the huzun and a remarkable photo shoot on the shore of the Bosporus. 2011 March – Horror days: Work was about to start on the feature horror movie “The Pollutant”, scripted by me, directed by Prakash Belawadi, produced by Helena Danielsson of Hepp Film Co, but then somebody got the bright idea that we need a big Bollywood star for the main role. So the hunt goes on and casting is still underway as the month ends. If you are a big Bollywood star and would like to act in a horror movie, do drop me a line. /---/ Meanwhile, "Once Upon a Time in Scandinavistan" is doing great. Happened to drop by the tiny Bookworm bookshop in MG Road and the proprietor proudly declared that he had sold 67 copies in the last few months and asked for an autograph. 2011 January – Chatshow month: Year started with a gig at Kolkata Literature Festival on January 15, a panel discussion on the City as a Muse, among the other participants were Shankar of Chowringhee fame. A week later, January 23, I was in conversation with Swedish crime fiction master Henning Mankell at the fabulous Jaipur Literature Festival in Rajasthan; and I was also reading from my own latest novel “Once Upon a Time in Scandinavistan” in an uproarious session together with Marina Lewycka, author of “A Short History of Tractors in Ukrainian”. Still it was a bit of a pleasant surprise that my novel made it to the top ten sales list at the festival, a list that was otherwise primarily filled with better writers than my humble self. The festival featured more than 200 authors doing 140 sessions, over 60,000 heads in the audience (500 press), some 10,000 books were sold at the festival bookshop, and JLF has for natural reasons been dubbed the Woodstock of Indian Publishing: check out the highlights in this India Today special report by Rajni George, here’s the Tehelka story, a little grumpy as usual, here’s Times of India’s investigative report into the litfest phenomenon, here’s the Telegraph, here’s from The Diplomat, and finally a blow-by-blow account in a Sri Lankan daily newspaper. /---/ One interesting thing that happened, sort of by the way, was when the leader of the opposition in the Swedish parliament, Ms. Mona Sahlin, resigned and then the conservative Prime Minister Mr. Fredrik Reinfeldt handed over, as a farewell gift, an Ipod pre-loaded with the audio version of my book “Mahatma!” (I bet a pirated version, these politicians can’t be trusted), and this final face-off was broadcast on TV, radio and analyzed in major newspapers – perhaps if they both actually read/heard the book they could learn to behave better. /---/ But the real highlight of the month was the Tehelka annual fiction issue, this year a genuine collector’s item and sometime in the future it’ll be worth its weight in gold or Old Monk – the theme was Pulp & Noir, see cover image underneath and read my short story "How to become a good serial killer". Or hear it. 2010 October - Touring isn’t boring: After Anjum’s performances at the Berlin Literary Festival we carried on to Sweden to do a bit of back to the roots kind of touring. The Stockholm gig at Södra Teatern, on the main stage, was hilarious – featuring Samit Basu, master of Indian fantasy, click here for more details – and so very good for the spirits, and the following day we did a more serious talk show at Trappan in Gothenburg, the details are here; also during the week there were talk shows in Swedish national radio and on TV, and a longer interview spot on TV4, most of which you can check out online. The eminent magazine Situation Stockholm featured a lengthy interview conducted by one of Sweden's greatest journalistic profiles, Cyril Hellman, who is also a novelist, and he pointed out that: “Det ska erkännas att författare är ett avundsjukt släkte, men det finns ingen svensk jag unnar sina framgångar mer än Zac.” (Roughly meaning: "Admittedly we authors are an envious lot, but there's no Swede who has deserved his success better than Zac.") So... touring can be fun. /---/ Also started my own studio, the O'No Recording Empire, and the initial recording was a backing vocal track for one song on a forthcoming album by Un Rodo Cora. 2010 September - Hat trick or tricky hat: First week of the month, worked on Mint Lounge lead essay on crime fiction in Australia and also a Singapore story for Swedish radio. Then during the rest of the month, in quick succession, the paperback edition of “Summan av kardemumman”, last year's best thriller in Swedish, was published; which was followed by “Gandhi - Eller kunsten at vende verden op og ned” (People’s Press/ARTPEOPLE Publishing, Copenhagen), the Danish edition of “Mahatma!”, and final week of the month, fresh off the printing press came advance copies of “Once Upon A Time In Scandinavistan” (Hachette, New Delhi) although it will be in the shops only in November. End of September we went to the Berlin literary festival, and then for a writerly residency at the very pleasant Baltic Centre for Translators and Writers in Gotland. 2010 August – Some wizardry in Oz. Proofs done for Scandinavistan detective novel and I think Hachette is sending it to be printed now. Moreover I also heard that some of the earlier Swedish books, that have become sort of classics, may be reissued soon in a new format. While we wait and see, I'm off to Australia to explore the literary festivals in Brisbane and Melbourne on behalf of Outlook Traveller Magazine (and where Anjum, by sheer coincidence, will be speaking and launching the Australian editions of her novels during first week of September). En route will try and stop in Singapore long enough to pop into Raffles Hotel and down a Singapore Sling, as well as have our photo snapped in front of Sydney Opera House. Photo-proof, as they say. Underneath: afternoon at Raffles. 2010 July - Meet and greet: Had an interesting visit by Mikael Gustafsson, who runs the Gautampuri Facebook page (as in the town featured in my novel "Once Upon A Time In Scandinavistan") and who was touring around India, and we exchanged views on things such as the toddy shops of Kerala. /---/ My debut novel “Pajazzo” (originally published in Swedish in 1997) was re-edited for ebook release, and is now finally available from http://www.serum.se/ and also downloadable from all leading ebook distribution channels. New cover here, and finally it looks the way I always wanted it to look (OK, so it is actually based on one of my own photographs). 2010 June- Summertime: Edited an excerpt, consisting of three chapters, from the forthcoming novel "Once Upon A Time in Scandinavistan" to be published in the July issue of The Caravan Magazine (New Delhi), which should hit the stands across India soon. /---/ Did a brief radio lecture on global popular culture, for Swedish National Radio, on June 22. Published this month: contributed several essays on Indian literature and some notable authors - including the rather old but almost classic piece I've written on RK Narayan (which has been reprinted I don't know how many times now) - to an anthology called "Indienexpressen" (ed. T Lofstrom & B Wallin; ISBN 978-91-633-6617-8), which is a sort of encyclopedia on Indian writing brought out by The Indian Library (Stockholm). 2010 May - Jobworking time: A month of editing books, old novels for re-releases and new ones for future release, contributing to various magazines, co-wrote a heavy metal song together with the Swedish band Freak Kitchen (which will hopefully become a big worldwide hit) and also, towards the end of the month I’m speaking at an interesting festival of delightful Pakistani horror movies (invite underneath, click to enlarge). 2010 March – A newsless month isn’t a useless month: The movie contracts were negotiated by my agent, so now one just has to wait for the films to be made... While busy waiting, I wrote half a draft of my next novel and… well, wrote. /---/ Highlight of the month was the release of ‘Table by the Window’ (Raintree Media, ISBN 978-81-906620-3-1), in which Raghav Shreyas documented regulars at Koshy’s café on St Mark’s Road in Bengaluru – the lavish photo book includes a lovely black and white mugshot of myself and Anjum spread out over p.92-93. 2010 January - Hollywood next? Or maybe Bollywood: Had series of meetings with Hepp Films, who are looking at producing a set of movies based on my original screenplay "The Pollutant" (working title) and my novel “Tandooriälgen” (aka “The Tandoori Moose”, aka “Once Upon A Time In Scandinavistan”, aka “Swedenstani”), with some possible prequels and sequels. You know the drill: please keep your fingers crossed and your eyes glued to this website. /---/ "USA" (1998) was reissued as an eBook (Publisher: Serum.nu ISBN 978-91-89424-93-7) as a sort of ten year jubilee edition, see new cover underneath. /---/ End-month, joining Anjum at the Jaipur Literary Festival in Rajasthan. 2009 November - Website Up and Running: After sufficient dithering and inertia, I managed to figure out how a dotcom is registered and this website is finally and properly online. So now you are officially welcome here. /---/ Received copy of “Innan Ganges flyter in i natten” (Publisher: Tranan ISBN 978-91-86307-07-3), an anthology of Indian poetry translated into Swedish; which features translations that I’ve worked on, of poems by K Satchidanandan, D Vinayachandran, Nissim Ezekiel, A K Ramanujan, A K Mehrotra, Jeet Thayil and Anjum Hasan. 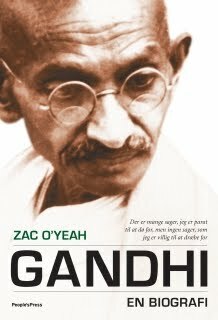 2009 October - Soon Available in English: Publishing house Hachette negotiates to buy English language rights for my crime novel ‘Tandooriälgen’, to be published in India in 2010 and tentatively it is going to be called ‘Once Upon A Time In Scandinavistan’. Recently, there has also been interest from other countries. /---/ Also during the month Anjum’s new novel ‘Neti, Neti’ was launched in New Delhi at a do in a bar called Haze, and where the Shillong-based rock band Soulmate performed. 2009 September - Touring, Touring: Did several readings in Sweden and a seminar around the new book at the Swedish Book Fair, end-September, in Gothenburg – very suitable, as it is a city which features prominently in the thriller. /---/ En route, participated in a TV-documentary about my wife, Anjum, which was being shot in Finland. 2009 August - Published Best Book So Far: New novel out (my best so far, in my own opinion) in Swedish, ‘Summan av kardemumman’, (Publisher: Ordfront ISBN 978-91-7073-420-3) the title is based on a traditional Swedish saying, ‘the sum of the cardamom’, which essentially means ‘everything taken together’ or ‘all things considered’. It is a thriller. /---/ As the recipient of the Artur Lundkvist & Maria Wine stipend, spent one month working on a new book idea (or actually two ideas), in the birth home of the Swedish author Artur Lundkvist in Perstorp. It was spectacular. 2009 July - There Are People Who Like Me: Was informed by a writer colleague who had discovered a Facebook club with the headline “Nobel Prize or something like that for Zac O'Yeah”. I particularly liked the “or something like that”-part, and so decided that it is high time to revive my own website. I had started one in the last millennium, www.zacoyeah dot something or the other, which during the years 1999 to 2001, counted some 26.000 entertained visitors who presumably were saved from the Y2K blues; but I can’t find the files now – if and when I do I might post them here. Meanwhile, I hope that book lovers will make do with this.